Continuum is a 3D game viewed from the Third person and was one of the first 3D platformers. The player will pilot a "Mobile", a craft which bounces off of the platforms that fill the rooms. 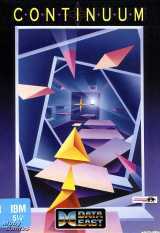 The game comprises of 256 rooms, which you explore while in search of 16 crystals and 16 cubes. The Mobile bounces from platform to platform, making its way around the room to the doors that lead into other rooms. On the way, players will encounter many other creatures and vehicles, as well as exciting surprises, such as rooms with reversed gravity. There are two modes two modes of play: emotion and action. In action, players start in the center most room, and work their way around, while being timed. Players gain time when going into a room they haven't been in before and when crystal or cube power-ups are picked up. When time runs out, the Mobile explodes and the game ends. In emotion, players can choose to start in any of the 12 regions that reside within the 256 rooms (the 256 rooms are grouped into 12 regions). The regions are arranged in the context of different areas of the human brain. While there is no timer, players also can't explore beyond the region that is chosen. This game is viewed 3rd person to the Mobile vehicle via a camera. The mobile rotates left and right, thrusts forward, and can move the camera up and down for optimal viewing.